David Price: “The CIA Is Welcoming Itself Back onto American University Campuses” | Democracy Now! founding member of the Network of Concerned Anthropologists, which just published The Counter-Counterinsurgency Manual: Or Notes on Demilitarizing American Society. He is also an associate professor of anthropology at St. Martin’s University in Lacey, Washington, and the author of Anthropological Intelligence: The Deployment and Neglect of American Anthropology in the Second World War and Threatening Anthropology: McCarthyism and the FBI’s Surveillance of Activist Anthropologists. David Price broke this story for a CounterPunch newsletter in the article “Silent Coup: How the CIA Is Welcoming Itself Back onto American University Campuses.” David Price is a founding member of the Network of Concerned Anthropologists, which just published The Counter-Counterinsurgency Manual: Or Notes on Demilitarizing American Society. He’s associate professor of anthropology at St. Martin’s University in Lacey, Washington, and the author of Anthropological Intelligence: The Deployment and Neglect of American Anthropology in the Second World War. 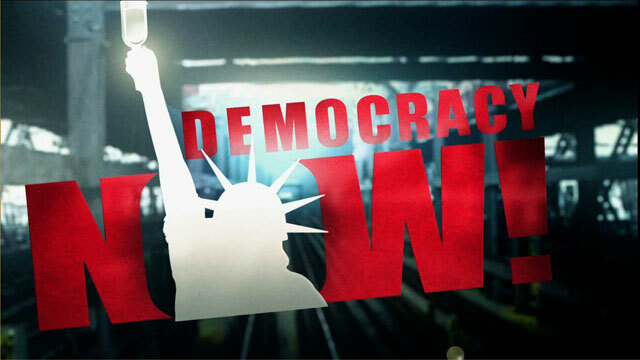 Welcome to Democracy Now!, Professor Price. Tell us what is happening on US campuses. DAVID PRICE: Good morning, Amy. [inaudible] has actually started it, you know, probably twenty years ago, as American university campuses, sort of a piece at a time, started shifting towards more of a corporatization model, so that the interests for research, rather than coming directly from professors, often came from outside sources. Since 9/11, there was a very dramatic shift, where President Bush and members of Congress and members of the intelligence community in the Pentagon started a real hue and cry, saying that somehow 9/11 could have been prevented, if only there were greater links between the intelligence community and academia. And after this post-9/11 move, there were many programs, things like the Pat Roberts Intelligence Scholars Program or the Intelligence Community Scholars Program, which secretly link scholars with intelligence agencies and embed them on campuses doing scholarship, and programs like the Minerva Consortium for the Pentagon. This latest program, ICCAE, is — it’s very surprising how aggressive it is. As you said, it’s now on twenty-two university campuses, where these centers are openly established, and scholars are working with a whole variety of intelligence agencies. So it’s a move that’s been made under the public claim that it will make intelligence better. But very clearly, the largest outcome that will come from these programs is not that we’ll have better intelligence; it’s that the institutions, such as the Central Intelligence Agency, the National Security Agency, the FBI, Homeland Security, they’re sort of damaged institutional culture will start to seep in and start to have a greater presence onto our university campuses. AMY GOODMAN: What understanding is there of students and professors about these ICCAEs? DAVID PRICE: You know, the knowledge is very fragmentary. One of the things I did in this CounterPunch article is I talked about the establishment of these ICCAE centers on several campuses. But I had access to a surprising number of documents from the University of Washington that showed that across the campus there was internally a very noble and direct hue and cry about these programs when they were in the planning stages. I had memos from members of the Anthropology Department, the Southeast Asian Studies Center, the International Studies Fund, group of librarians, Latin American Studies, Jackson School of International Studies, in which, internally, to the provost and deans, there was a very strong and detailed protest, a protest that cited the history, you know, the dark history of agencies like the Central Intelligence Agency, and tried to internally resist these centers from being established. But at the University of Washington, as with these other institutions, the administration simply rolled over this critique and established these centers anyways. AMY GOODMAN: Finally, talk about McFate. DAVID PRICE: Montgomery McFate is a American anthropologist who’s been involved in a number of initiatives to use anthropology in military settings, the most famous of which is the establishment of human terrain teams. Human terrain teams are — it’s a program that’s run through using contractors, and it embeds teams, including social scientists — the dream is to use anthropologists, but they’re having a very difficult time getting anthropologists to join for ethical reasons — and these teams embed with troops, with the Army and now the Marines in an experimental program, in Afghanistan and in Iraq. And, you know, the public claim is that these human terrain teams are there to reduce harm, that you have these, McFate has used the phrase, “angels on the shoulders of commanders in the field.” But very clearly, there are other things that are going on. There’s elements of targeting that are going on. So it’s not simply that there’s — you know, that these are educators in the field. It’s a very controversial program. Two months ago, the American Anthropological Association received a very long and detailed report outlining the problems with these human terrain teams and, you know, issued another condemnation of the program. AMY GOODMAN: Well, David Price, I thank you for being with us. We’re going to follow this story. Associate professor of anthropology at St. Martin’s University in Washington state and a founding member of the Network of Concerned Anthropologists.